The City has announced this meeting is being postponed. They will announce a new date for the meeting soon. Please join the City of Providence Department of Planning and Development and RIPTA to review the latest plans for improvements to Greater Kennedy Plaza. These improvements are the result of a community-led vision that began in 2017. How many bus routes will stop @ Amtrack? I’ll be there, I’m curious to see what real improvements will be implemented. What a waste of money. The 2013 version looks exactly like this, i’m all for transit and public realm but how many times are they gonna redo this plaza. The clearest example of white privilege in Providence. With so many areas of the city suffering from slum and blight, city planners’ (with Elorza’s approval) sole focus on “improving” KP should be of grave concern to everyone. Big Papi, what are you talking about? Is this the world we live in today? Trolls finding any way possible to make the discussion about race? Yawn. This has nothing to do with race. Kennedy Plaza is currently a bus hub that mostly lower income demographics use. Do you actually have a point? Or are you just trying to spew negativity on this awesome board? This whole area has suffered from a timid hand. It wants to be everything to all people: ‘the plaza should be a place to walk through and sit… but it should also be a city bus depot with three lanes. And a police substation. Oh, and throw this Civil War statue in over here, because plazas have statues and this one has to go somewhere.’ And it ends up being a feathered fish; not quite one thing or another. My two cents: Make it a walking plaza. Merge all the surrounding streets into the plaza. Shut off traffic to all vehicles except essential deliveries. Clear out the bus station building, and the statues. Install something like the I.M. Pei Louvre Pyramids and call it a day. Despite the cities best attempts, this will probably not be a place where people want to linger, but it can be a beautiful place to pass through. It should also be said that Burnside Park is a terrible design. Every path into the park plops you at the fountain in ten paces. It goes against the purpose of a park, which is to meander and discover. I don’t know of the park has always been this way or if there was a re-design in the 1970s, but it deserves to re-imagined, especially in the context of a new Kennedy Plaza. I like that statue , it’s important to the plazas history. I like the addition of the play structure which creates a more family friendly area. One problem is you can’t walk through burnside with out seeing homeless all over. Also, having 60 ft busses constantly traveling through Kennedy is the exact opposite to having a pedestrian friendly public space, and destroys the connection from the financial district to waterplace Park. GGG: Nope, no trolling. Just trying to have a thoughtful discussion about the fact that Providence planners continue spending valuable time and resources on an area of the city that has been extensively planned/studied while refusing to provide equal treatment and capital to other areas with significantly greater need for their expertise. Jeff runs a great blog and my comments are provided to entice a wider examination of what transpires in the city. Sorry for intruding into your comfort zone. Question for Jeff et al: What are the Mayor’s positions concerning the Fane project and the Woonasquatucket redevelopment plan? Gio, I can meet you halfway on the statues. They’re not bad, but in my view their positioning in the plaza is awkward and perfunctory. For instance, it would be much better if the Soldiers and Sailors Monument was placed on an axis curve, so that it would lend itself to being approached on foot (its human nature to walk in a curving trajectory, not straight on). It would also put itself in the natural flow of foot traffic, rather than the polarizing center. And I fully agree with you that it is poorly suited to perform as a bus depot and a public plaza at the same time. They city must pick one or the other, because its never going to be both. Its too intimidating to try and cross here if there are huge buses moving in and out constantly. With Fulton St side left open to car traffic the planners appear to want to keep some of the bus option open. I do not agree; better to find somewhere else. To those saying the money would be better spent elsewhere in the city, I disagree. Geographically speaking, Kennedy Plaza is as important to Providence as Times Square is to NYC, Trafalgar Square to London, City Hall Plaza to Paris, or Piazza Navona to Rome. They are lifeblood centers, crossing points to explore anywhere in the city. KP may not be as large as these, but the function is the same. The city’s health depends in part on how well it functions as this crossroads and that it be a welcoming place for visitors and locals alike. I would theorize that it attracts homeless people because of that very fact, its a natural meeting place. But I don’t have any solutions to deter them that wouldn’t be punitive and classist. Its definetely a problem though, particularly with panhandlers along Washington St.
those of us who actually use buses know that a hib at KP is much better for us than the dispersed enpoints all over the city that existed prior, leaving passengers with no access to info, indor shelter, bathrooms, little sense of security, difficult transfers etc. So far, attempts to find another location for the buses have failed because of lack of space, other abutters didn’t want them or the location was out of the way where passengers didn’t want to go. The Providence train station is in all 3 categories. The people who use the buses in KP are disproportionately low income, people of color. That’s one reason some of the stakeholders want them elsewhere, (but where??) and another redesign. As I’ve said before, Providence has the worst of both worlds with regard to parking. Not enough easy, free, near the door parking to compete with strip malls, office parks etc but too much parking for transit to succeed (even though its still needed for the many who can’t drive or can’t afford to derive there) and too much parking for there being a beautiful city to walk around in. As for the latest KP redesign, I tend to agree lets not spend much more and leave well enough alone, but it looks like they are proposing many fewer bus stops, possibly making things less convenient for passengers. With regard to how much money and effort has gone into redesigning KP over the years; yes it has been done, but its never been done well. This is no excuse for not getting it right, and its troubling to me that its been about 20 years since the initial redesign and the area is still an uninspired, unwalkable mess. But if theres a possibility of getting it done right it should be pursued. I sympathize with those that take the buses there (I use to ride the 99 to Pawtucket), but I believe the plaza will keep failing as a space if it keeps trying to accomodate large amounts of bus traffic through there. It may be a practical place to catch a bus, but it makes it little good for being used for anything else. And the shortsightedness of public policy rears its head. A surplus of car parking, but not enough places to park conviently, or park and catch a bus. No political push to build a centralized, modern station anywhere in the city. I believe the current trend of eliminating parking minimums might help Providence in this if it were to adopt this measure, also price charging for congested areas and roads so that the revenue could be put into building a station and other amenities. The latter would be unpopular but helpful. A regular reminder that the right time to redesign KP would be after the redesign of the bus system. Then, KP or a nearby street could have dedicated lanes where a few high frequency bus lines pass through promptly. You would not need a place where every route in the state terminates, requiring room for all those buses to pull over and idle. 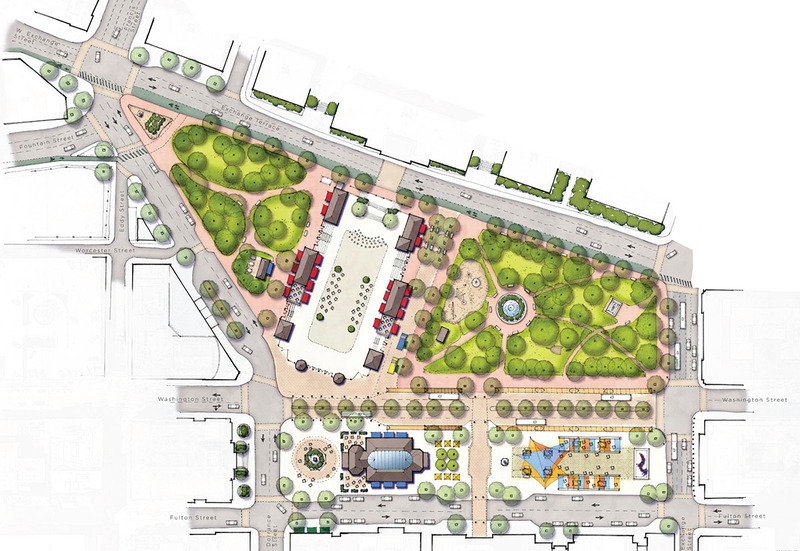 Part of this redesign of the Plaza is indeed to accommodate the new redesign of the bus system, the Downtown Transit Connector. The 8 routes that through-route along the DTC corridor will now layover at the northern end (the Train Station) or the southern end (RI Hospital) freeing up space in Kennedy Plaza. There is also planning to extend the bus only lanes from the center of the Plaza along Washington Street to the bus tunnel so that buses have bus only lanes from Thayer Street straight through the tunnel to Dorrance Street. I’m not sure if those improvements are planned as part of this current Plaza project or a subsequent Phase. I read over the DTC literature and re-examined the Planning Dept’s rendering. It seems like a good idea for transit, but more of a half measure in realizing KP as a working plaza. If the mayor’s vision is something akin to Bryant Park, this probably won’t do. Wjen designing a public space, Frederick Law Olmstead worked from a concept called ‘the inner square’ and ‘the outer square’, roughly meaning a public space could be divided into an interior zone and and exterior zone. The success of a square depended on how accessible one zone was to the other. Right now the island composed of Intermodal Bus Station and its platforms is the ‘inner square’. The streets surrounding it, Washington, Dorrance, Fulton are the ‘outer square’. Because of the large road widths and traffic, this outer square is basically a wall around the inner square, discouraging movement in and out of it. Under this plan it looks like the city wants to take down one of these walls by merging Washington Street to the inner square bus terminus, but leave the Fulton St and Dorrance St walls up. This would encourage more walking movement from Burnside Park to the Plaza and back, but leave it nowhere to go from there. However, It might be possible to somewhat still connect the plaza together if the road widths were shortened in front of City Hall and the Superman building, but I’m not certain of the success of that. It would be much better if the forecourt of city hall and the sidewalk were merged into one with the inner square of the plaza. If I had a say, I would be in favor of throwing out the hub and spoke model of transit and go for something that relied on the grid as Andrew stated. I just realized I omitted one of the outer square streets: Exchange St, in front of the Federal Courthouse. Well I’ll be! Something instead of nothing. means where there just happens to be room without reducing lanes or parking and not where they will do the most good? Profound mediocrity is a chronic design outcome of anything that involves the Providence Planning Department. The plaza does contain a lane for auto traffic, but its width is narrow and the approach is slowed by traffic calming measures on the exterior streets. There also seems to be a bike lane. The planners have used the crescent shape of the area to their advantage, laying out the cafe area of the plaza on a rising curve that hugs the also curving sidewalk. As I’ve stated in earlier posts, the KP inner plaza at present fails to use curves or shapes to its advantage in placing statues, buildings or seating areas. Everything is built along a straight line of axis. This is a huge loss because in addition to discouraging foot traffic from the outer plaza (the wide streets in front of City Hall, Burnside Park, Federal Building, Superman building), it confuses movement within the plaza by insisting in its layout that all movement flow in two static linear directions: either towards City Hall or towards the Federal Building. At present the inner plaza does not recognize Burnside Park or Downcity. I hope this can be corrected in the redesign. Thank you. THIS EVENT IS POSTPONED. THE CITY SAYS THEY WILL ANNOUNCE A NEW DATE SOON. Anyone who is on the Kennedy Plaza Transit Board must ride the bus to and from work for 3 months, before they are allowed to have any planning on Kennedy Plaza or RIPTA. Yes, maybe they are too special to ride, but we really need to make sure this is the last redo for the Plaza and RIPTA for many years AND even though the special people don’t have to ride RIPTA it would be nice that they created a system than encouraged more and more people to live, work and play in Downcity with the help of a great public transportation. Alas, we have a few landlords downtown that depend on rent from the state and city for their VACANT properties (another issue we need to topple…TIF’s with STIPULATIONS and SPECIFIC TIME LINES. If landlords don’t produce what they agreed upon they MUST return the public money. To digress a bit, but to the point Wil was making about the bus system, while visiting London last year I was impressed at how much work had gone into integrating all forms of public transit together and making the experience of using public transit easy and even enjoyable. To this end, cash fare collections are no linger accepted. Instead, riders use pre-paid contact-less Oyster Cards which allows for boarding without queuing. They are good for just about any form of transit: buses, trains, taxis, even water taxis. Some bus routes emphasize their sightseeing aspects. Some buses run non-fixed routes, allowing riders to choose stops while others do not. All children under 11 are allowed to ride for free. Detailed, interactive maps are posted on most street corners, especially in the city center, to encourage walking and help people in deciding whether to make their journey on foot, bus, bike, train or a combination thereof. This wide-ranging approach to transit is sorely needed in this in country, where so many of us are resigned to our cars and creeping obesity. And while I’m mostly opposed to continuing KP as a bus hub, I do think KP has a part to play as a place to buy fare cards (we should just already do this), tickets for shows, or just ask simple ‘where is this?’ questions. I think this change would make a major difference in how visitors and locals get about, view the city, and eventually effect the local economy. All it takes is a little creative thinking.